Len Costantini from our marketing team swims with whales…. “Hold onto your mask when you jump in”. they said. “Swim hard and follow the guy in high-vis rashy – he knows what he’s doing! Above all, whales don’t fly! So keep your head down and in the water”. Nothing like a set of clear, concise instructions when you are jumping off a boat, 15 nautical miles into the Pacific Ocean, to swim with a pod of 36 tonne Humpback whales. I mean really, how many truly ‘wow’ moments do we genuinely get in our lifetimes? We might get plenty of excitement for sure, but as for the real, I am actually doing this right now, kind of wow, how many do we get? Well, the wow hit me well and truly as a recent guest of Sunreef Mooloolaba’s Swim with Whales. The adrenaline kicked in as soon as I hit the water, paddling hard to keep up with our guide as he weaved this way and that, following instructions yelled from the boat (how did he do that with his head underwater?). Well stay with him I did and treading water, head down, was rewarded with what many have described as a life-changing experience. I can understand why. Straight ahead and just a couple of metres below, was a baby humpback whale, still showing white skin signifying its youth, about to pass directly beneath us. I was mesmerised by the presence of this ethereal beauty. A visitor in its habitat, immersed in the experience, I just let myself live the moment. Breathing was optional. I think there was still a snorkel tube in my mouth if I needed it. It just couldn’t get any better. But how can I see the ocean floor so far out to sea, and why is it moving? Then it came to me, directly underneath this colossal baby, itself the length of a transit van, was its mother, a fully mature doyenne of the sea, as large as the vessel we came on. With a combination of immense proportion and sublime gracefulness, she swept through, gently, yet with the momentum of a freight train. Behind her, were another two mature adults. At that point, a big shout out to the crew is deserved. Sensing the whales weren’t in the least bit phased, they swung the boat back in front of their trajectory for another swim. This time I saw the baby again, at eye level, and I swear she/he (I can’t bring myself to call it, it), rolled over, raised a fin and gave me a good long, inquisitive eye-balling. Wow. Majestic, awe-inspiring, impressive, there have been lots of words to describe such a sight up close and personal, but at this point, for me, the English vernacular just runs out of superlatives. It’s hard to explain the feeling, but there was something in the water with me and the whales on that 4-hour cruise. I was on such a high when I got back to the office, the staff wondered what I was on and wanted me to hand some around. It lasted for days. The rush, I think was, in part, because finding whales to swim with, is not straightforward, despite the estimated 33,000 Humpback whales that will pass Noosa this year. While we had incredible luck, it wasn’t until towards the end of the tour, largely as a result of the crew’s sensitivity to the whales in choosing the right moment. After take-of, everyone had eyeballs on the water to spot the tell-tale signs of whales, including their ‘footprint’ surface wake, air blows that can reach 3-6 metres in height, and surface ripples. It didn’t take long to spot a young female and her calf. However, protective of her baby, this lady wasn’t interested in playing and kept dodging the boat. Whales are apparently like humans in this respect, overly protective and cautious of their first born, whereas a more experienced mother will be more relaxed about letting their calf get up close and be more inquisitive. After half an hour of keeping a respectful distance and sensing the young mother wasn’t keen, the crew decided to move on, rather than try to get too close. According to skipper Bill Carranza, this sensitivity to the whales is paramount. “One of the things we want to do is make sure that this is sustainable. A positive experience with the whales will mean they will be more likely to have a positive interaction in the future”, he says. “It’s also out of the respect of the animal. She has got her baby there and if she doesn’t want us around we just need to respect that and stay away. “Take later today when we had a baby whale pop right up in front of us and boom, throw that baby into neutral and just sit there and wait until you can find them again before continuing to move, so we can make sure they are absolutely safe”, he says. After five years at the helm of Swim with Whales, Bill has developed a reputation as something of a whale whisperer. “For the majority, I can tell what the whale might be thinking of doing, and then yes, I can get a feel if they are going to be interested. “This has to be on their terms. The key is to get out in front of them, hang out there, let them make the choice to come close and have a look”, he says. Throughout the tour there is strong emphasis on education around the whales, the marine environment and conservation. 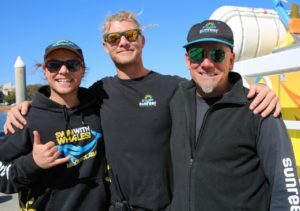 “The biggest thing about having this interaction with the people and whales is that it creates that awareness of why we need to continue to protect these animals”, says Bill. “This is one of the most remarkable comebacks in the animal kingdom with 33,000 this year, but in the late 1960s there were less that 500 on the east coast. But this is all the more reason we need to keep the focus on awareness and continue to protect their environment and not become complacent”, he says. Humpback whales head north in June, July and August, to the warmer waters off the north Queensland coastline to breed and then travel south again to Antarctic waters from mid-August to November. For Bill Carranza, this is a dream job, but he feels the pressure to be the best he can to make sure guest have the opportunity to experience the whales up close and personal. Curious, I asked him how my Swim with Whales experience compared to other tours he has led? “There is always something different. Every day is different and every year is different. “But every time we get a calf that close is a truly unique experience”, he says. Hastings Park Noosa’s luxury Hastings Street accommodation is an ideal location to base yourself for a whale experience, whether it be watching whales from the Noosa National Park or taking a short trip to Mooloolaba to go whale-watching or to swim with whales. Sunreef Mooloolaba operates Swim with Whales – Australia’s first Swim with Humpback Whales experience. This 4-hour tour (from $149) involves the opportunity to enter the water with an experienced guide when whales are sighted and conditions are right. Mooloolaba is close to Noosa and easily accessible by car or Sunreef offers transfers subject to conditions. See www.sunreef.com.au for more information and bookings can be made at reception. Off the South-East Queensland in the early fifties and sixties, around 40,000 whales were slaughtered for their blubber and meat which was turned into stock feed for Australian farmers. The numbers of whales in the area became severely depleted. From an estimated 400-500 in the mid-sixties, Humpback Whales have since recovered strongly in the Southern Hemisphere migration cycle, increasing to an estimated 33,000 animals and continuing to grow by about 11% every year. Incredibly, at the time of writing, Japan wants to overturn the 32-year ban on commercial whaling. Earlier this year it was reported that three Japanese whaling vessels returned home from a trip to Antarctica with a haul of 333 whales – killed for ‘scientific purposes’.